The Greater Austin Chamber of Commerce unveiled Opportunity Austin 4.0 at the end of 2017, the latest version of its plan for economic development. This iteration seeks to expand existing efforts by allocating more resources toward efforts to address major challenges in the region and take advantage of opportunities by focusing on transportation, affordability and innovation. 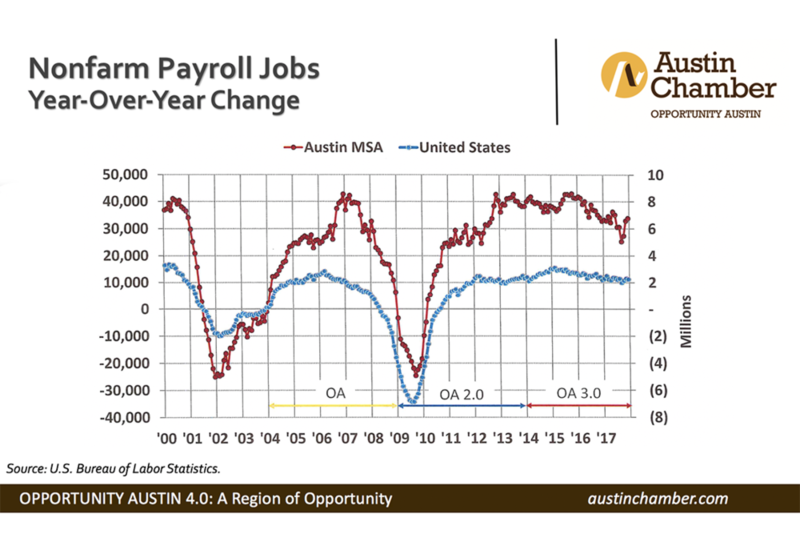 While Opportunity Austin 4.0 will seek to continue recruitment efforts that will hopefully generate more foreign direct investment in Austin, the plan includes a heightened focus on investments in local companies and workers. Gary Farmer, president of Heritage Title and chairman of Opportunity Austin 4.0, wishes to see 161,000 new jobs by 2023, an increase of the region’s average annual wage to $66,000 and a decrease in the poverty rate from 11.7 percent to 9.5 percent. Farmer and his colleagues are aiming to raise $30 million to carry out programs involved in the success of Opportunity Austin 4.0, which will be used to expand existing initiatives such as recruitment and retention programs as well as the implementation of new programs. Included in the roadmap for Opportunity Austin 4.0 is a think tank-inspired concept named “Opportunity Studios” which the chamber plans to use as an incubator in which they can gather and focus on certain issues as they come up through completion as issues are resolved. A defining component of Opportunity Austin over the past 14 years has been the chamber’s focus on high school to college enrollment, but the newest iteration will focus on the 30 percent of high school graduates that will not go to college. The chamber aims to implement a Direct-to-Work initiative which will extend opportunities to that group of individuals not seeking a college degree, which will in turn lower poverty in the region. For more information on Opportunity Austin 4.0, visit the website or contact one of our knowledgeable agents.